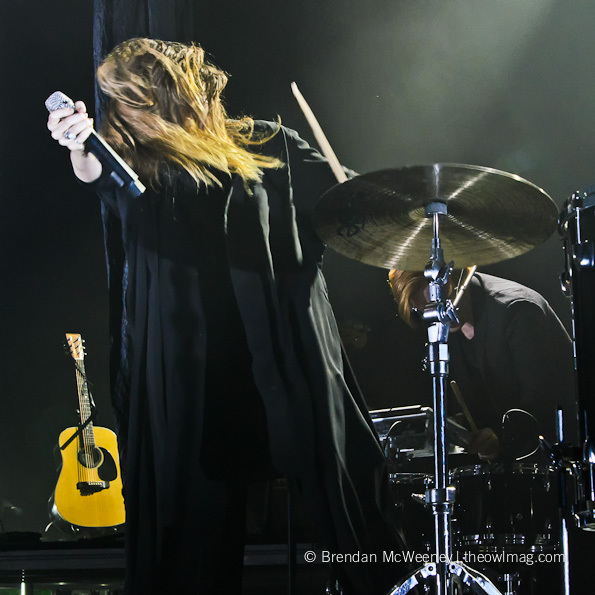 Lykke Li has spent the majority of 2011 tirelessly touring in support of Wounded Rhymes and on Wednesday night, with help from her fellow Swedes First Aid Kit, she performed at the Fox Theater in Oakland for the first time ever. Upon exiting the Fox Theater after the show, the following three thoughts ran through my head as I strolled the streets of Uptown: the Swedish government must put magic potion in the country’s water supply which effectively elevates the artistic genius of its citizens upon ingestion; the term “Swedish minimalist” does not merely refer to a style of interior design; and the floor toms are perhaps the most under-appreciated and under-utilized drums in the kit. Whether those thoughts provide more insight into my own psyche than the show is for you to decide. 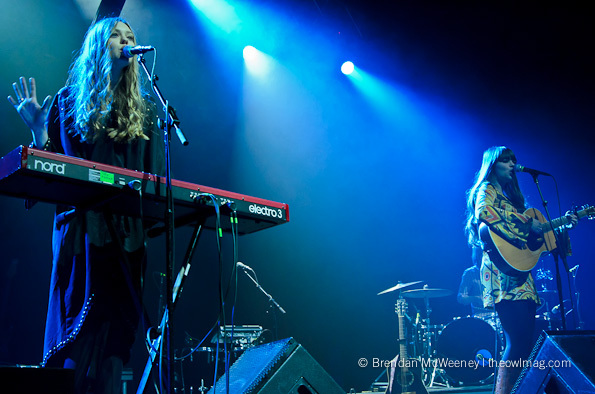 Heavenly is the best way to describe First Aid Kit, a folk inspired duo consisting of the Söderberg sisters, Johanna and Klara. The songwriting from this young pair speaks to the weathered and toiled life but the vocal delivery is soulful which is magnified by sisterly harmonies. Klara has some powerful pipes and crispness in her voice has a hint of rasp when she bellows. The instrumentation is stripped down to the functional essentials; an acoustic guitar, a keyboard, and a simple drum kit which allowed the songwriting and vocals to take center stage without any distraction. 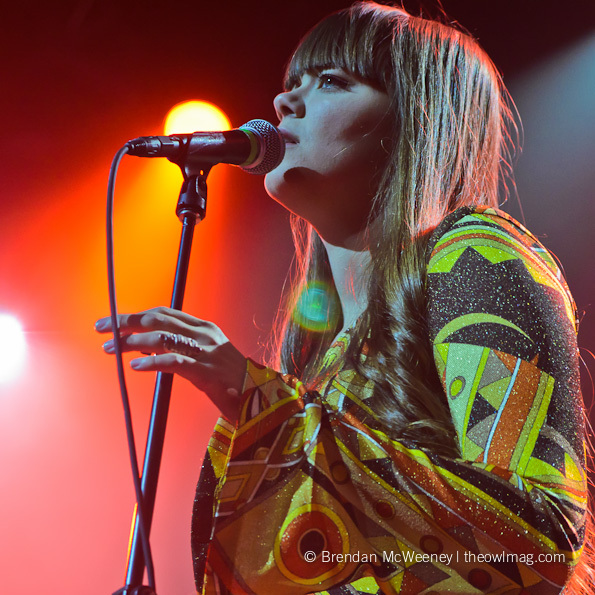 First Aid Kit will release their second full length album, The Lion’s Roar, on January 24, 2012 on Rabid Records. 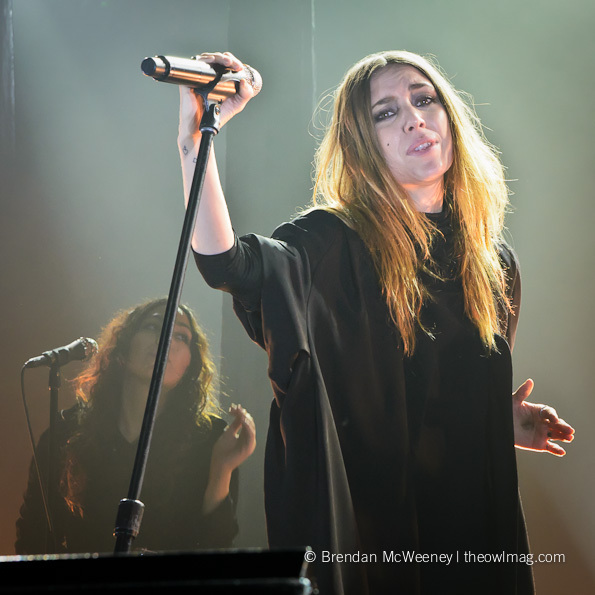 After a long introduction of the electro-instrumental version of “Love Out of Lust,” Lykke Li appeared onstage draped in what has become her trademark long black cloak without her usual Robert Palmer “Addicted to Love” slicked back hair. There is nothing forced or contrived about Lykke Li. Every toe tap, arm raise, and hip sway is effortless. Covered from neck to toe in black fabric, she oozed with sensuality slithering and writhing to the drum break at the end of “Jerome” which opened the set. 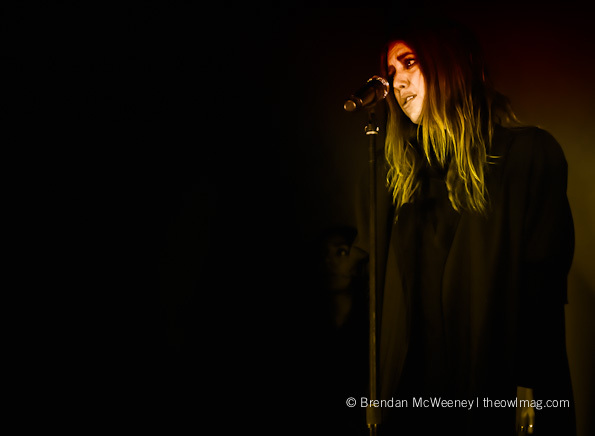 Though the short fourteen song set list consisted mostly of tracks off Wounded Rhymes, it allowed Lykke Li to showcase her versatility as an artist in one abbreviated go-round. The performance not only blended genres and time periods with electro-based “Little Bit” and 1960s Ronnettes-inspired “Sadness is a Blessing” but also equally mixed the hauntingly beautiful with the danceable anthems for an amazingly cohesive show. Mid-way through the set, Lykke Li bravely tackled a cover of the Righteous Brothers‘ “Unchained Melody.” While anyone would have a difficult time rivaling the original, she did her best to put real emotion into the delivery slowly and sweetly singing, “I’ll be coming home, wait for me,” with a sense of longing and a twinge of desperation. A good effort, but in hindsight, it felt a bit lackluster. The album version of “Dance, Dance, Dance” is relatively subdued and quiet and the live arrangement deceivingly began the same way with the percussion stripped down to a cowbell and clanking drum hoops until the song crescendoed to full on chest throbbing rhythms provided by drummer Lars Skoglund. While most drummers seem to passively sit behind their kit and drum with their upper body only, Skoglund is one of the most active drummers I have seen going from sitting to standing while playing the kick drum and putting the force of his entire body into the floor toms creating a rich and soulful heartbeat that is characteristic of Lykke Li‘s sound. Someone needs to give that man a handshake and a hug for keeping her live performance grounded and powerful. 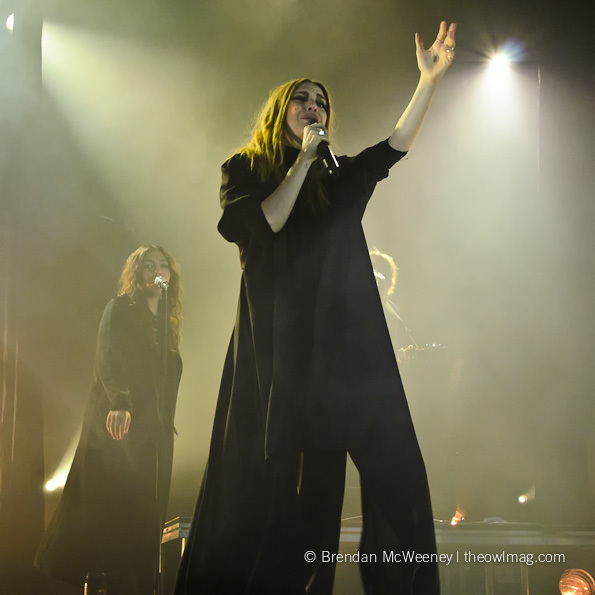 The show in its entirety from First Aid Kit to Lykke Li‘s encore performance of “Unrequited Love” proved that the Swedes are going to be permanent fixtures in the indie music scene along side their countrymen Jens Lekman and The Knife. Now, where can I get some of that Swedish water?